Most Americans live in counties that are at least partially protected by earthen and concrete levees, according to Federal Emergency Management Agency (FEMA) statistics obtained by the New Orleans advocacy group Levees.org. While those levees do not necessarily protect all the people living in the 881 counties that have them, a study for Levees.org by geographer Ezra Boyd concludes that the levees more than pay for themselves when their cost is compared to the investment they protect. The Times-Picayune ’s Mark Schleifstein writes that counties with levees account for only 28 percent of the U.S. counties and only 37 percent of the U.S. land area – but they contain 55 percent of the U.S. population, more than 156 million people, according to the study. In Louisiana, 37 of 64 parishes contain levees, and those parishes contain 74 percent of the state’s population, and 75 percent of its annual total income. On a per-capita basis, residents of those parishes earned about $1,000 more a year in 2000 than their counterparts in parishes without levees. Levees usually do not create the population living in the counties in which they’re located, Boyd said.. “Rather, it is the landscape features associated with levees that explain this observed population trend,” he wrote. Schleifstein writes that people are attracted to rivers, lakes, and seashores and their associated floodplains because this is where the maritime industries, municipal and industrial water supplies, farmland irrigation, sustainable seafood harvests, and recreational opportunities are located, he said. The levees often follow, as residents attempt to reduce the risk of flooding. 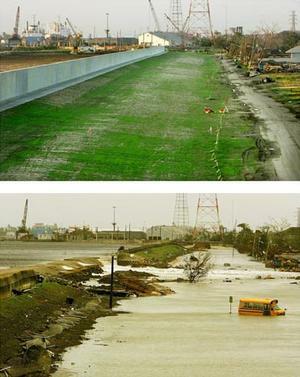 In recent years, especially in the aftermath of the flooding from Hurricanes Katrina, Rita, Gustav, and Ike, a number of critics have argued that investments in levees should be limited, in favor of stronger measures aimed at discouraging people from living in flood-prone areas. It is that criticism that prompted Levees.org to attempt to show how many people nationwide rely on levees for safety, said founder Sandy Rosenthal. The group sees its mission as educating the public about the role of levee design and construction errors in causing a majority of the flooding that occurred in New Orleans during Katrina. It has expanded that mission during the past year to educating other communities about the potential effects of similar failures of their corps-designed levees.